A spring weather in the middle of the winter… or this is what can bring the warm rays and play on light with Fabergé’s uplifting Summer in Provence high-jewelry collection. 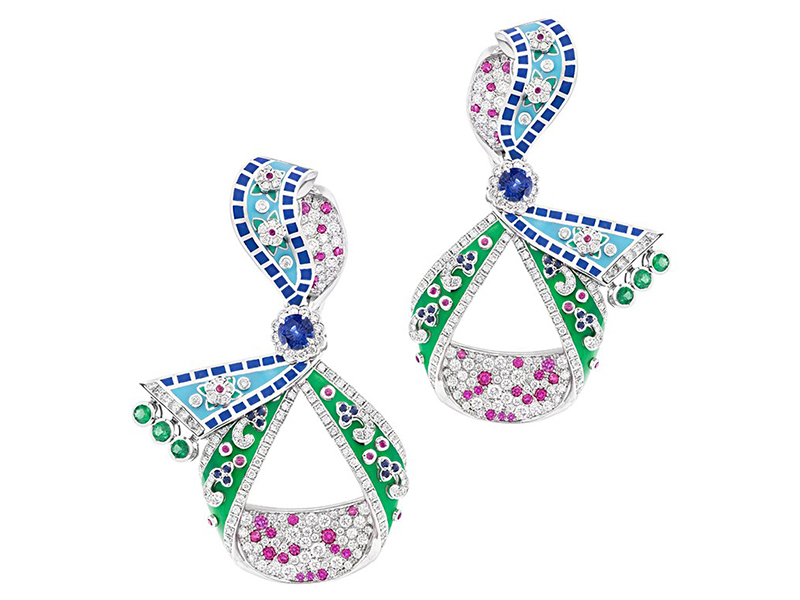 The exuberant beauty and rustic charm of the French countryside is perfectly relayed trough a colourful array of deep blues, mesmerizing greens and playful pinks with the illuminating sparkle of diamonds. 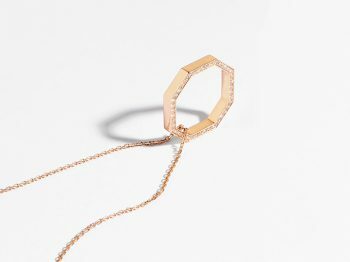 It is not too often that the unique landscapes and floral patterns of a region have been so eloquently captured and immortalized in a line of textured and layered jewelry that captivates with the contrast of bright colours. There is a distinctive undertone to the Summer in Provence. 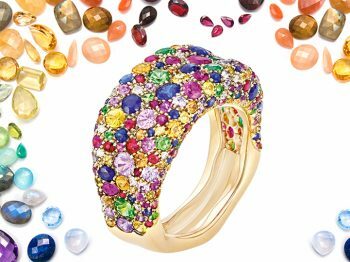 Faberge’s latest high jewelry collection presents a literal and figurative bond between all pieces – bringing out the bounty of the French region as well as the brand’s love for intricate and embellished designs. A modern interpretation of the ribbon – the motif is a nod to Russian folklore and serves to accentuate the collection’s vivid colour palette and unique designs. 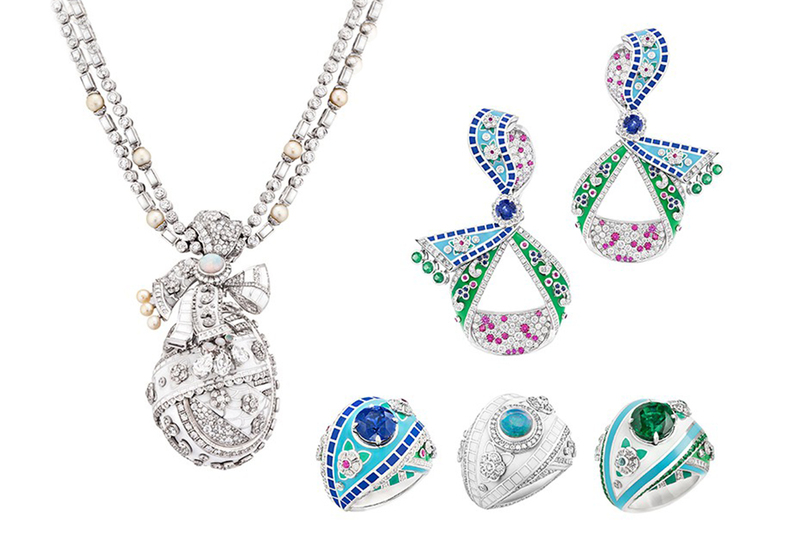 Textured necklaces, earrings and rings demonstrate a vivid combination of polished enamel with a variety of precious stones – pearls, diamonds, sapphires, tourmalines and emeralds. 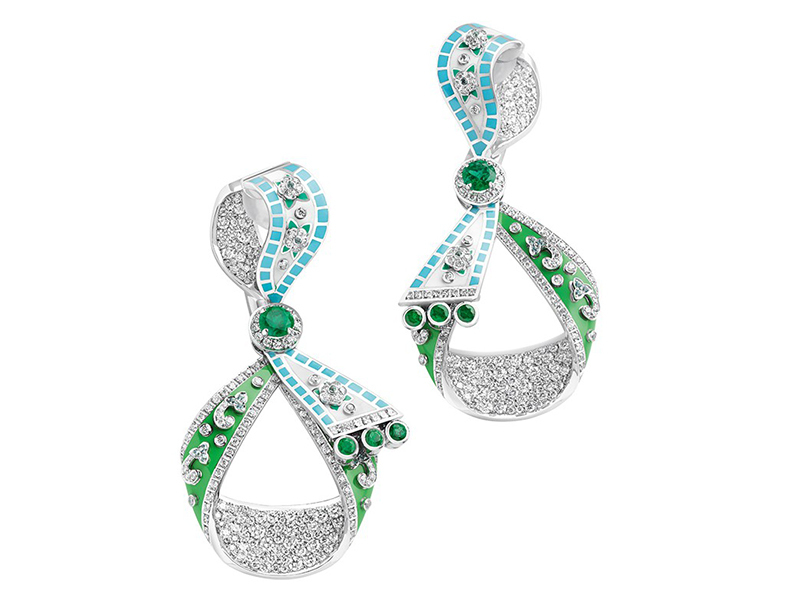 The rich vivid tones accentuate the intricate patterns and designs of the transformable and graceful jewels, evoking an image of the serene azure skies, hypnotic green sea waters and fields of quaint flowers. 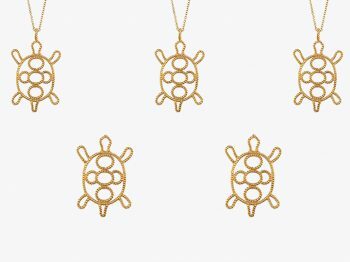 Each of the dazzling pieces is visually reminiscent of the abundant life on the French Riviera and its many luxurious treats. When the gloomy winter season is nearing, this is the easiest way to steal a piece of summer and enjoy the caress of the warm summer breeze recreated through the gentle feel of the precious stones against the skin. Turquoise, pearls, enamel and Paraiba tourmalines come together in dynamic compositions of pure luxury and mesmerizing symmetry. Three unique jewellery sets incorporate delicate floral patterns in contrasting materials and colours to bring out the natural beauty of the precious stones. The end result is an awe-inspiring play of light and unparalleled level of elegance for the charming and contemporary woman whose bohemian spirit just can’t be kept caged. 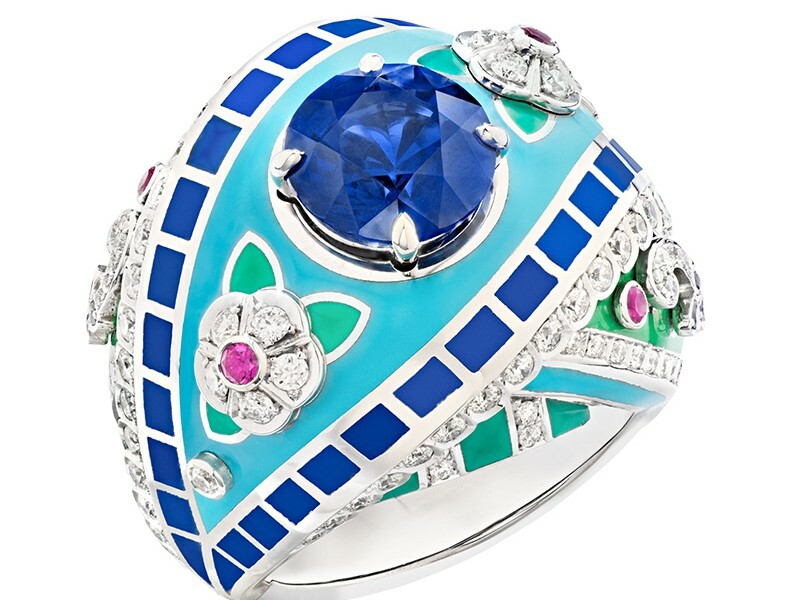 The legacy of the House of Fabergé is celebrated with the Summer in Provence collection in a way that showcases the brand’s superior craft techniques as well its daring spirit that leads it down a road of constant re-inventing of traditional motifs within a more modern context. Exploring the marvellous gemstones entwined by the gentle curves of the ribbons of flowers evokes a feeling of organic compositional balance. 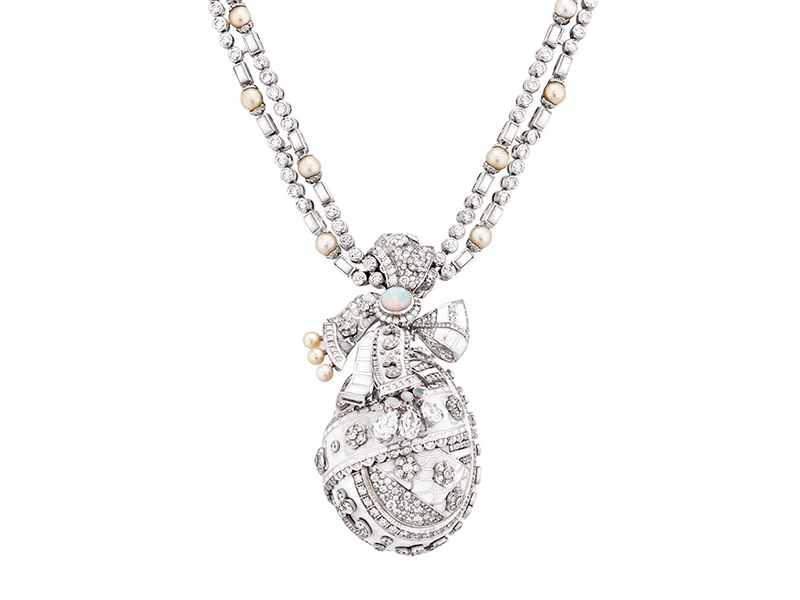 Beautiful flowing forms are observed throughout the line and in the necklace piece are accentuated a tassel of precious gems and a detachable egg, pained in the true spirit of Fabergé. There is a watch portion as well and it doesn’t fail to impress as it exhibits the same design motifs, colour palette and meticulous craftsmanship as the jewellery collection. Three variations of the 37mm watch come in an exquisite array of breath-taking versions: from the white diamond-covered model to the multi-coloured sapphire one. 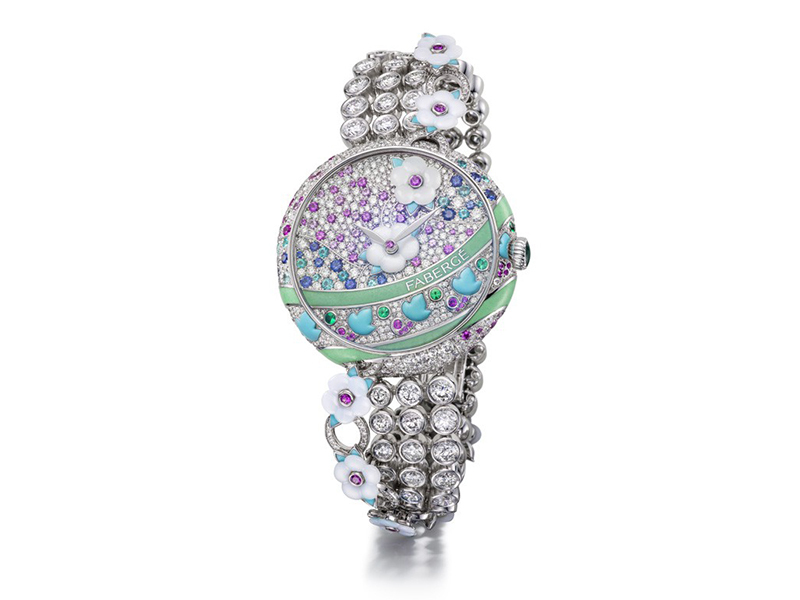 All are an epitome of class and sophistication with the Provence Emerald watch being a true work-of-art. 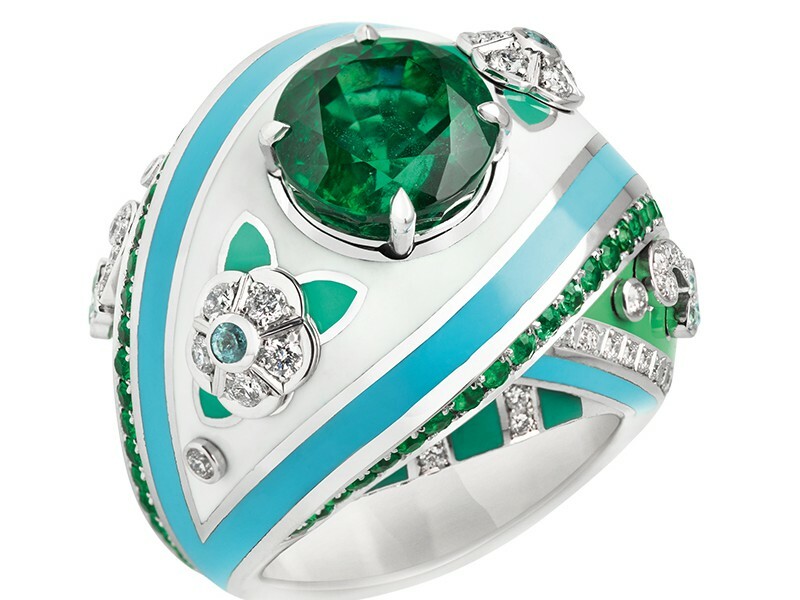 374 diamonds, 17 Paraiba tourmalines, 10 emeralds and a ribbon-shaped turquoise enamel rest on top of a 18k white-gold case, topped with enamel. 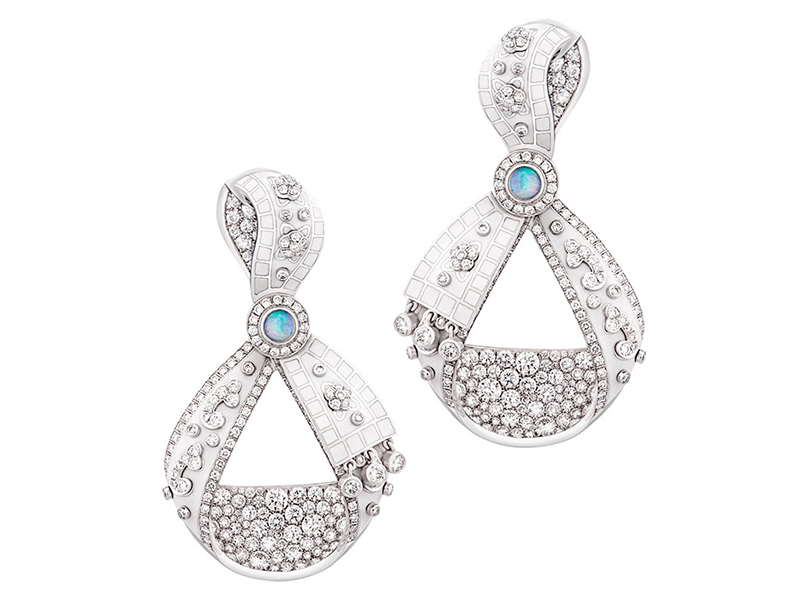 Delicate flower embellishments, freshwater mother-of-pearl, beautifully complete the composition. The Summer in Provence collection was first introduced during Baselworld 2015… Being just a few weeks from the 2016 season … how will Faberge surprise our sparkling appetite?